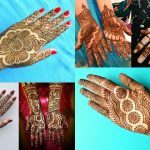 As we know that mehendi is one of the significant part of our culture. 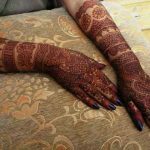 Women of all ages love to apply mehandi. 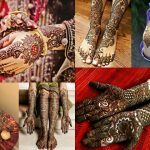 Nowadays, mehandi is also used on the leg, which not only provide a great charm, but also enhance the beauty and gorgeousness of our leg. 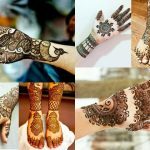 Stylish and elegant mehandi design for leg can be different style including Indian or Arabic that is really a piece of admiration. 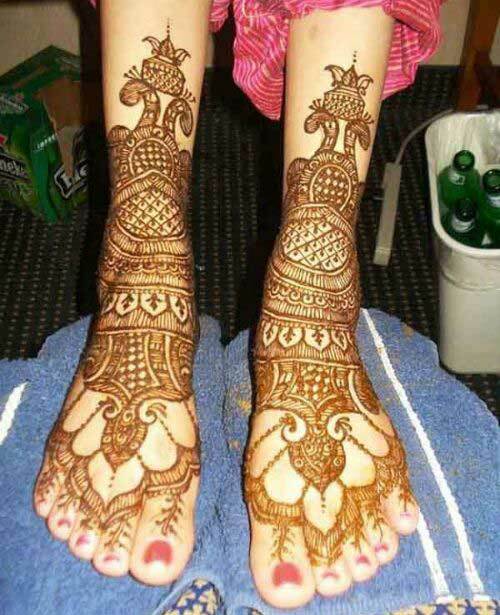 So go and enjoy the graceful mehendi design for leg and add grace and charm on your leg. 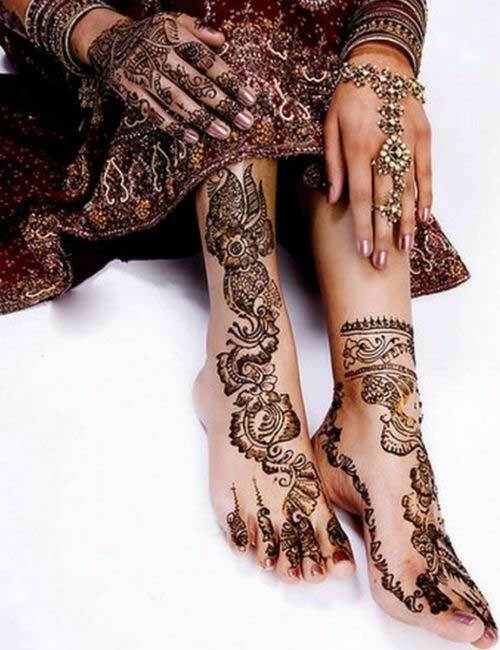 This one of the excellent Mehendi designs for leg by which your legs look very gorgeous and elegant and allow any woman feel like a queen. Its intricate designs talk about the expertise of the artist. It is basically an anklet type design which makes your ankle look beautiful. This is very simple as well as cute Mehandi design. This is nothing other than curvy line running across the edge of your foot like a border. It’s simple looks make it more cute and different than others. Today, this design is mainly opted by teenagers because it has a modern look. Gujarati Mehendi art is always designed elaborately and in detail. This design is mainly opted during wedding as it has a great ornamental look. Your feet look great upon your feet. This pattern provides an appearance of an elaborate anklet adorning your leg. You can choose this elaborate pattern to cover up your leg where some well shaded floral motifs and leaves across your entire leg which is really excellent. The black shade of this mehendi design stands out against the lighter tone of our skin, which can make the petals more realistic. But, to create this design, you need some amount of patience. 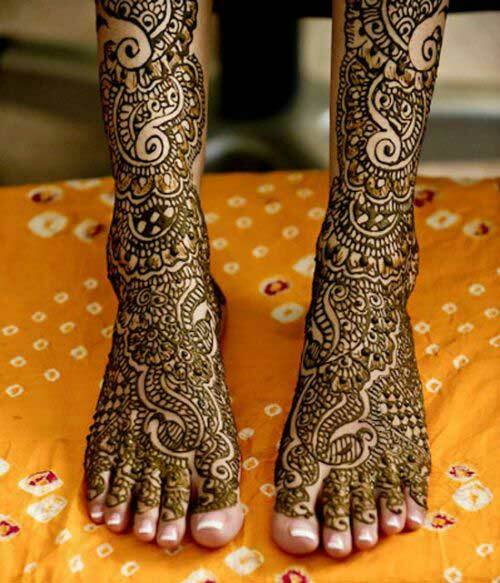 Round Leg Mehendi Design looks very pretty, sophisticated and graceful where round design is found in the centre of your foot. Very few patterns put above and below to complete design that makes overall design elegant. The round design means concentric circles with various patterns that adorn your leg. This is extremely attractive and eye-catching. Nowadays, the black Mehendi design has become extremely popular in Indian culture. This is mainly preffer by those people love prominent designs. In this design, the number of intricate patterns makes it more prominent and beautiful. Make yourself more modern and attractive with Mehendi. You can avoid the painful tattoos and can opt attractive henna pattern. The design start from the upper portion of your feet and running to the knees. You can make the great style statement with this gorgeous design. 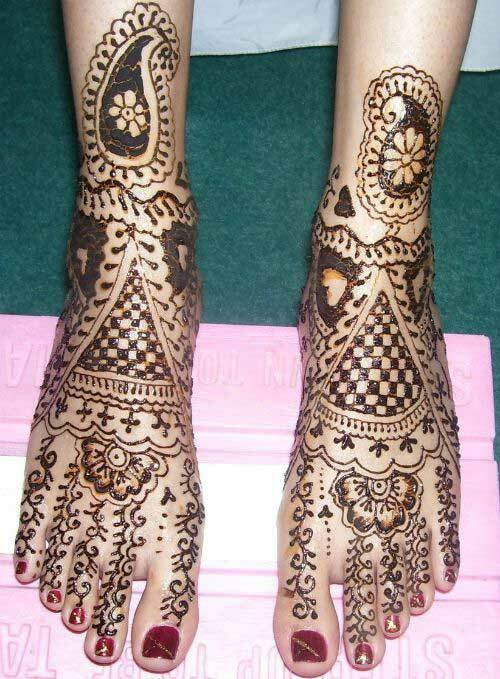 Bridal henna designs are generally heavily ornamental and also elaborate. This design is placed on above your feet. It looks like a beautiful ornaments which add more charm. 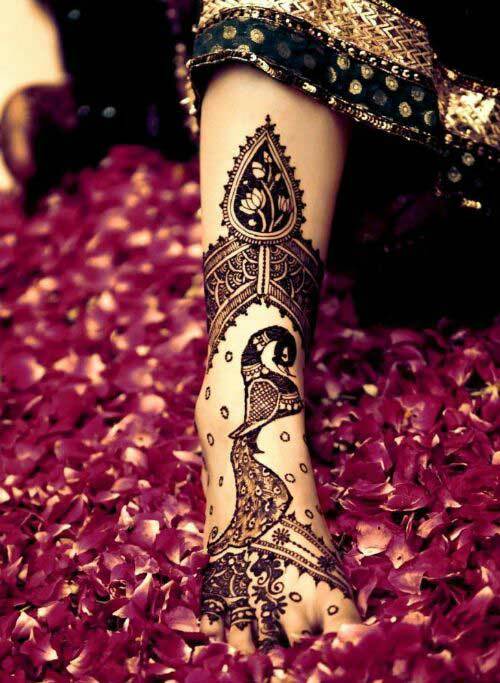 This is one of the gorgeous mehendi designs with flowers and diamond shaped motifs which look great. This mehendi design is quite easy to create but needs some patience. The total image is detailed and elaborate, but not heavily colorful. Today, most of the people like small and no fuss designs than complicated and very fine details. This design is a great combination of Floral and Arabic Mehndi Design. A Number of traditional floral motif and Arabic pattern inspired the themes in this design. This floral design is one of the trendy Mehendi design for the leg, which curling up your calf with very excellent way and your legs look great. This design is very easy to create and not a time consuming procedure. But this design is very common; because this is opt by many women. Nowadays, Mehendi designs are often shaded with glitter. It looks more vibrant and attractive with the sparkles of Glitter. In this design, floral motifs are running up the length of your leg which looks really gorgeous. This is a very common design, because it is very easy to create. Opting for any chic design and stylish design has various reasons to attract girls. 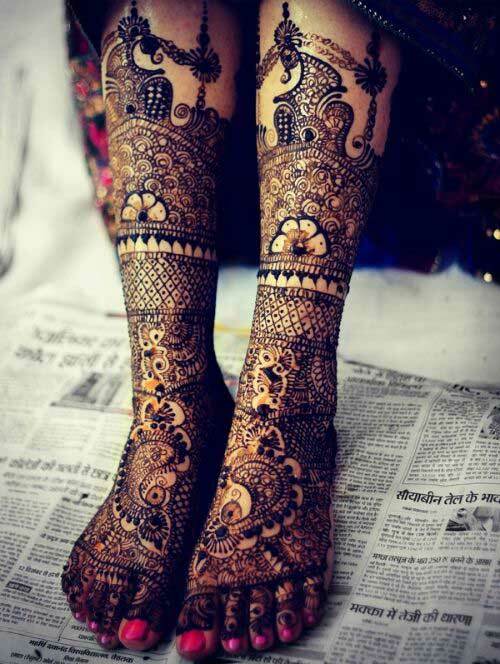 You can apply this Mehndi design on rear part of the legs, which makes your legs more gorgeous and alluring. The design looks really unique and attractive with its tribal art pattern. 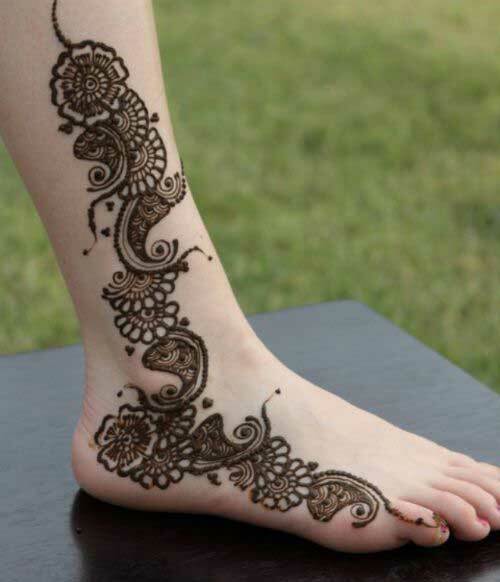 In this design, you make a touch of red and lush green on real henna color, that makes your feet more gorgeous! 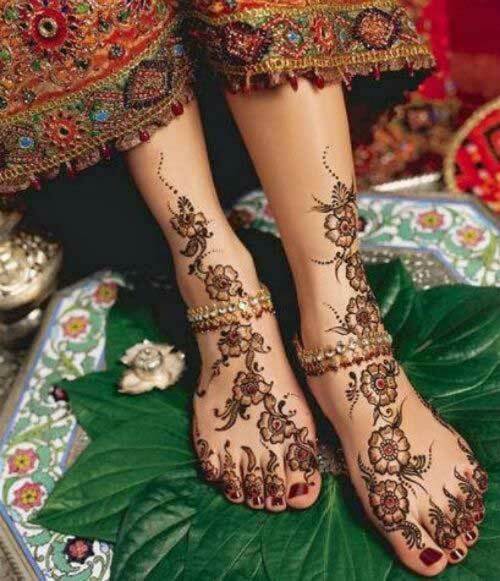 This gorgeous Mehndi design is very aesthetically crafted on the feet, this normally opted by the brides. 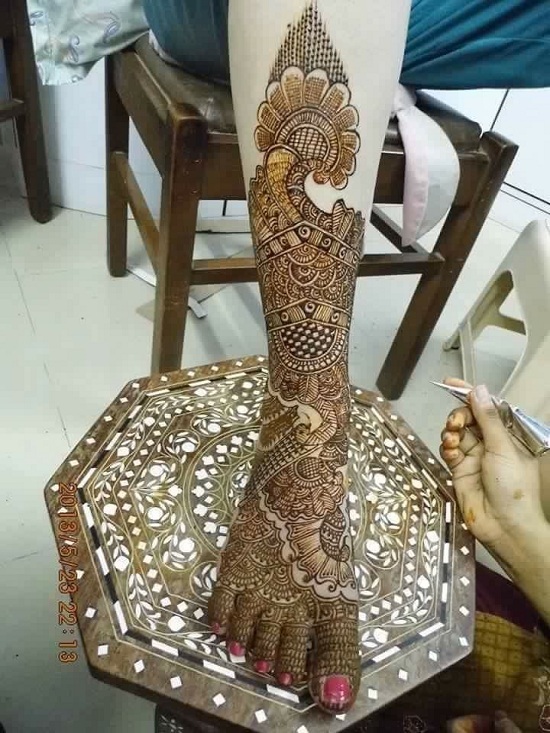 The tribal leg Mehendi Design is simple but excellent. It has a great tribal look which is created with some abstract pattern, so that this Mehendi design has a modern look. In this design you cannot find any floral motif, animal figure, some simple abstract like dots, spiral pattern adorn your legs. Legs are the most important part of our body and feet is the most open part. 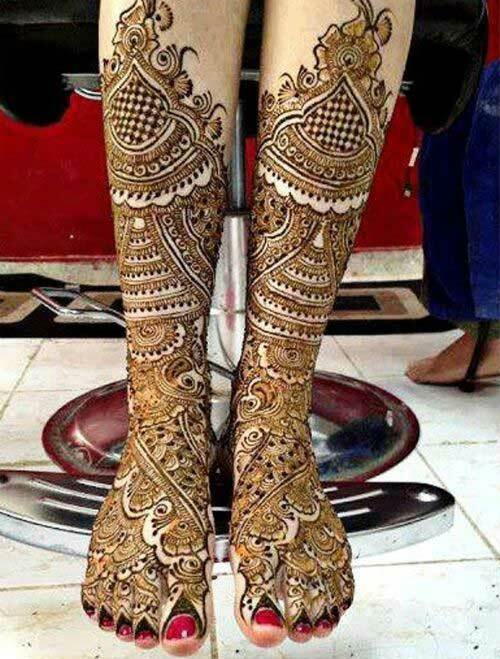 So, to decorate your legs you have to choose some gorgeous Mehendi design by which your legs become more beautiful and gorgeous. 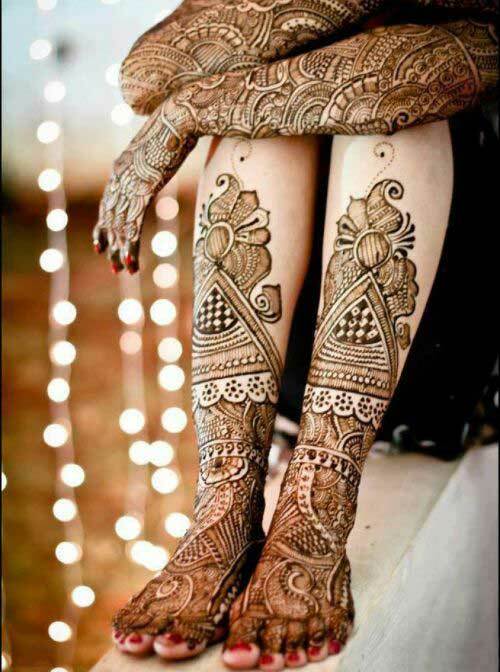 From above list eyecatching leg Mehendi design you can easily choose the best to adorn your legs. 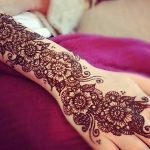 Stylish and elegant mehandi design for leg can be different style including Indian or Arabic that is really a piece of admiration. 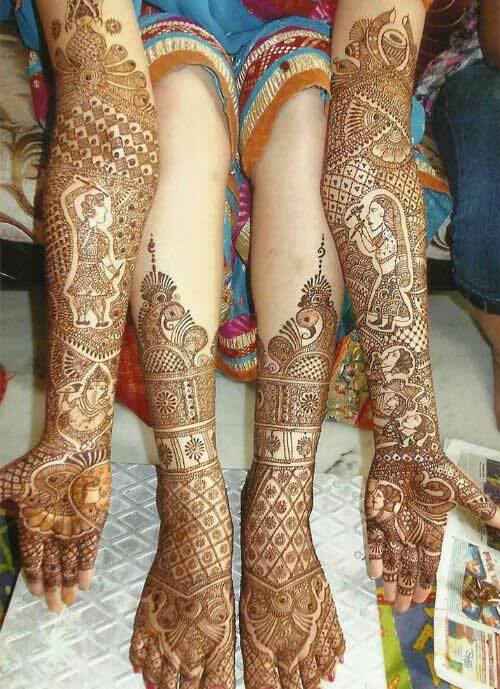 So go and enjoy the graceful mehendi design for leg and add grace and charm on your leg.